the godshow – Communicate 2 Connect Inc.
Are you ready to investigate the BIG Questions? Are you ready to take a wild ride from the sublime to the ridiculous? Are you ready to laugh and cry, be provoked and inspired, be nurtured and excited? Then come join us for the “godshow” (yes a lower case ”g”), an original, irreverent cabaret, written and performed by Sunshine Coast favourites Glenda O’Sullivan, Rainee Skinner and Sam Saunders. The godshow is as an irreverent, provocative and profound look at our spiritual quests and the big questions in life. Glenda, Rainee and Sam work together to write and perform drama pieces and songs, which provoke and nurture. These are woven into passionate cabarets full of insight, empathy and sardonic wit to explore current social issues including role conflict, stress in the workplace, dysfunctional relationships, burnout, spirituality and the regaining of personal power. The ever popular godshow was initially performed at the Noosa Long Weekend and is a clever romp which looks at our search for meaning in this rapidly changing crazy world. It has also been performed at festivals, launches and conferences for business, government and communityorganizations. This performance of the godshow is a fundraiser to support actions for world peace – training people in Living Compassion and Compassionate Communication. These local talented performers are donating their warm and witty show to raise funds to support people to attend trainings which build capacity to live peaceful, authentic, compassionate lives; and contribute to creating a peaceful, co-operative and compassionate world. Rainee, Glenda and Sam have been writing and performing original cabaret shows together for almost fifteen years. Their drama pieces and songs aim to provoke and nurture. These three creative souls come from different perspectives and disciplines. Rainee has worked as a professional actor since 1981. Some of her film and television credits include The Wayne Manifesto, Medivac, The Day of the Roses and G.P. Rainee is a UQ Graduate with a post graduate Diploma in Creative Writing from the USC. She is an experienced ESL and communication teacher. She is also a talented playwright, having been in the top three of the Noosa Playwriting Competition, two years running. Sam has a Licentiate Diploma in Music from Trinity College London and has been involved with the music scene on the Sunshine Coast for over thirty years. Sam is a founding member of MUZIKA, the iconic Afro-Celtic band. He is appreciated for his diverse musical styles and he enjoys an outstanding reputation as an inspiring music teacher, as well as being a skilled composer, arranger, recording artist and performer. Glenda has a Master of Arts in Drama from QUT, and has a particular interest in the relationship between creativity and self-esteem. She works in tertiary institutions and the private sector teaching a variety of courses to enhance personal communication, public speaking and business presentations, creative writing and confidence building skills. Glenda is also a glorious singer who has released a CD of her own original songs. 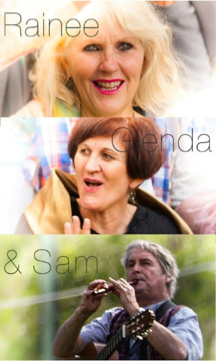 Together Rainee, Glenda and Sam weave spoken word and song into bold cabarets, using sardonic wit to explore social issues including role conflict, stress in the workplace, dysfunctional relationships, burnout and the regaining of personal power. The ever popular “godshow” was initially performed at the Noosa Long Weekend. It is a clever romp which looks at our search for meaning in this rapidly changing, crazy world. “It has been described as a wild ride from the sublime to the ridiculous,” says Rainee. “Some fans have seen the show 5 or 6 times. It is fun and also rather profound,” adds Glenda. Sam says he loves working with Rainee and Glenda. “One day at rehearsals for another show, Rainee was reading some of the work of the Sufi poet Hafiz to us, while we were having a coffee break. That was when the seed for the “godshow” was planted,” he said. If you are ready to investigate the BIG questions; to laugh and cry, be provoked and inspired, be nurtured and excited, then the ”godshow” is for you.